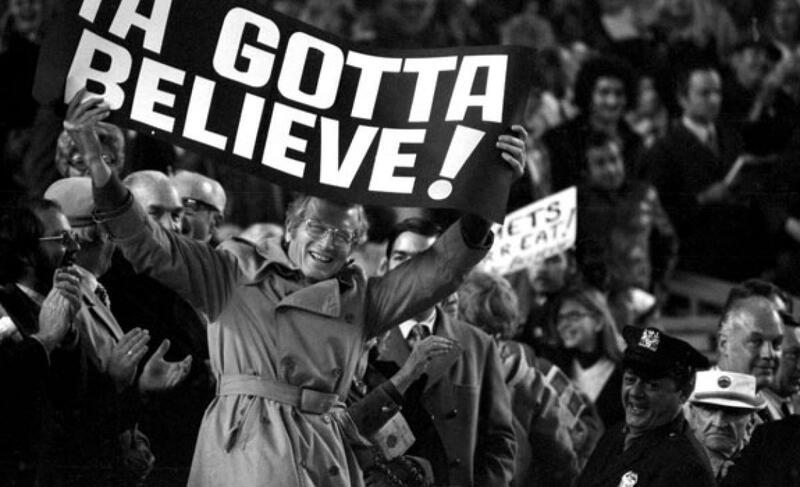 Game Recap: Mets 8, Nationals 5, Niese shaky but bullpen shines | We Gotta Believe! The Mets (76-61) defeated the Nationals (71-66) by a score of 8-5. The Mets led the game 3-0, fell behind 5-3, and rallied to win it 8-5. In game one of a very important series, the Mets got off to a good start against Max Scherzer. Curtis Granderson led off with a double over Jayson Werth‘s head (a ball he lost in the sun) and advanced to third on a wild pitch. Scherzer, however, retired the next three to strand Granderson at third. First pitch of the second inning, however, Michael Conforto hit an opposite field home run that just hit over the wall (and perhaps deflected off of Jayson Werth’s glove). Two batters later, Kelly Johnson hit a home run to right center, putting the Mets ahead 2-0 in the 2nd inning. Yoenis Cespedes followed with a solo home run in the 4th inning, and the Mets had a 3-0 lead against Max Scherzer. Jon Niese looked good at first, retiring the side in the first inning, and working out of jams in the 2nd and third. Location was a bit off, but he was getting grounders left and right. Then in the fourth inning, Niese imploded, allowing a leadoff single to Ryan Zimmerman, an swinging bunt infield single to Yunel Escobar, and a walk to Ian Desmond. Wilson Ramos continued to kill the Mets, lining a low curveball over the left field fence for a grand slam. After a single by Michael Taylor and a sacrifice bunt by Max Scherzer, Jayson Werth lined a double to center field, scoring Taylor and knocking Niese out of the game. The Mets were down 5-3, with just one out in the inning. Carlos Torres entered in a double switch with Ruben Tejada coming in to play shortstop and Wilmer Flores moving to 2nd, while Kelly Johnson came out of the game. He struck out Anthony Rendon, intentionally walked Bryce Harper, and got Ryan Zimmerman to pop out to David Wright in a long at-bat. However, the Mets came right back in the top of the fifth. Ruben Tejada and Curtis Granderson lined back-to-back doubles to cut the Nationals’ lead to 5-4. In the bottom of the inning, Torres allowed a leadoff single to Yunel Escobar, followed by a liner at Ruben Tejada that tipped off his glove into left-center field (inexplicably called a hit by the official scorer). Torres followed by getting Wilson Ramos to fly out and Michael Taylor to ground out back to the mound. While fielding Taylor’s grounder, however, Torres injured his calf and had to be taken out of the game. Erik Goeddel came out of the bullpen and got Max Scherzer to ground out to end the inning. In the 6th, Yoenis Cespedes led off with a booming double and after a fly out by Michael Conforto, coaxed a balk from Max Scherzer to reach third base. It was Scherzer’s first balk of the season. Travis d’Arnaud followed with a line drive to Jayson Werth, a sacrifice fly scoring Cespedes from 3rd. The Mets had tied the game 5-5 against Max Scherzer. In the bottom of the inning, Erik Goeddel coaxed two fly balls for the first two outs. Rookie Dario Alvarez followed, in his first major league appearance of the season, with a strikeout of Bryce Harper. He had fallen behind 3-0 to Harper before getting him to chase a slider for strike three. In the top of the 7th, Wilmer Flores led off with a single against reliever Blake Treinen, followed by a Ruben Tejada bunt in which Treinen barely got the force out at 2nd base. Lefty Felipe Rivero entered to face Granderson and walked him, putting runners at 1st and 2nd with one out for David Wright. Righty Casey Janssen allowed a liner just past Ian Desmond to score Tejada from 2nd, and the Mets had a 6-5 lead. Matt Thornton entered, the fourth reliever of the inning, and allowed a sacrifice fly to Daniel Murphy to make it 7-5. Yoenis Cespedes followed with another booming double to right field, barely scoring David Wright from first base. The Mets had an 8-5 lead. Hansel Robles entered the game in the bottom of the 7th and looked dominant. He retired all six batters he faced in the 7th and 8th, striking out four and using the quick pitch to his advantage. Since Tyler Clippard was not available (he threw 41 pitches yesterday), Robles’ great effort was perfectly timed. Jeurys Familia allowed a leadoff single in the 9th, but struck out Anthony Rendon, Bryce Harper, and Ryan Zimmerman to end the game. What a huge win for this Mets team, coming off a tough weekend in Miami and distractions galore with Matt Harvey. The Mets now lead the Nationals by 5 games. Matt Harvey faces Jordan Zimmermann tomorrow, with Jacob deGrom facing Stephen Strasburg on Wednesday.